Bunny Mellon, a Lady Gardener, American Style Legend and a mysterious jewel box to many. Holding memories of things that would mold her into the iconic legend that she became. 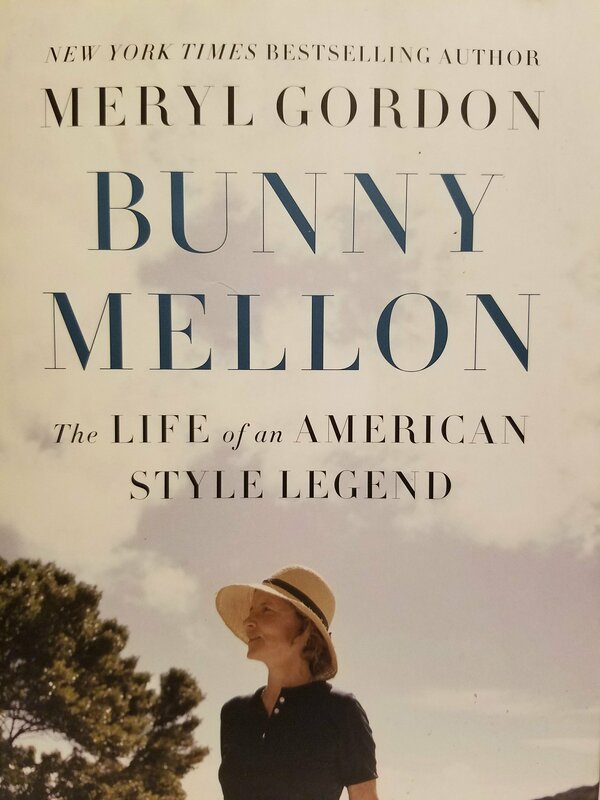 What a wonderful book that details the life and times of Rachel Lowe Lambert Lloyd Mellon, better known to the world as “Bunny” Mellon. Loving flowers and nature as a child, Bunny touched many landscapes, creating magnificent gardens of note. At 51 years of age, President Kennedy asked Bunny if she would create a rose garden for him to enjoy. Initially taken aback, Bunny answered yes and allowed her creative juices to lead her in the right direction. Bunny Mellon’s grandfather encouraged her to connect with the land. Arthur Lowe provided Bunny with a small plot of land to experiment with her passion – gardening. The two of them created a dialog that shared the joys of gardening and nature. This was a bond that Bunny cherished and one she continued through the written word when she was not by his side. Sketching the latest small bloom or a fallen leaf – it was the simple pleasures that gave Bunny joy. Known for a few of her eccentric traits, Bunny wanted a crisp, but time-worn look on the things that she loved. This was practiced not just in the house, but also in the garden. In the Mellon Garden, Bunny wanted everything just so…and she made sure that it was. Bunny Mellon was also a sister-friend to Jacqueline Kennedy. They were like two peas in a pod and the external world did not matter when they were together. Bunny Mellon also cared about people. Aware of the trouble her father’s business caused in Arkansas, Bunny tuned into social issues when she wasn’t embracing gardening. If Bunny liked you, she was your friend to the end. Many stories were shared about her loyalty upon her death. A collector of children’s books and fairy tales, Bunny’s world was colorful, bumpy, and definitely before it’s time. Twice married, Bunny became a step Mom and a wife at just the right time. Paul Mellon, Bunny’s husband was happily envious of the passion Bunny had for nature and gardening. Ever the gardener, no matter what she was up against, Bunny Mellon did it with style and grace. There are many interesting facts that the award-winning author, Meryl Gordon, shares throughout the pages of this easy to digest book. The Mellon family entrusted Meryl Gordon to share the life and times of Bunny Mellon. Tastefully written, Bunny Mellon comes to life in the pages of this book. Humanizing aristocracy can sometimes be difficult. Meryl Gordon has eloquently shared the good, the mysterious and the questionable that made Bunny Mellon the iconic woman that she was. Oh to be able to touch the books in her library. At 103 years old, I am certain that Bunny took many things to the grave. I am glad that we at least have more insight on who Bunny Mellon was. I am giving away 2 copies of this book on Saturday, October 28. Like the Cottage In the Court Facebook page, follow my blog, and comment on the blog why this book would be of interest to you. WE HAVE OUR WINNER’S!! Linda and Carol…check your email!! Thank you to all who took the time to read and respond to this #GIVEAWAY! I hope you continue to follow and share, as there will be more #GIVEAWAYS as well as thoughts on all things beautiful. I would love to read this book. I’ve heard of her but don’t know much about her history, and I love reading about inspiring, passionate women (especially gardeners!) Thank you for sharing! Bunny Mellon is one of those women who you just have to admire. I honestly would love to have been an ant on the shoe of the author to see inside the estate especially the library. I could see Bunny Mellon waiting to greet her guests as she paused from cutting flowers in her garden for arrangements. It truly puts a different face on the rich and famous and how they really lived. Sounds like a great book. I’m a fan of biographies and since this woman is a gardener, I’m even more intrigued. I have to say it is truly a terrific book. It really captures the reader and offers insight into the real world of Bunny Mellon. Thank you for responding to my blog. Having grown up during the Kennedy era I remember a number of these things quite well. But in those days I was more interested in the politics than the gardens. Since then I’ve become a gardener with a large library having been inspired by Mellon. i’d love a chance to know and read more about her. Isn’t it refreshing to realize that no matter what the public perceives about a person, there is always another side? Bunny Mellon seemed to be truly engaged with the earth and that was what, I think, kept her authentic. Thank you for reading and responding to my blog. This book would be of interest to me because I am partial to eccentric gardeners! This book is such an easy read and most importantly, it truly shows how real and uniques Bunny Mellon was. Imagine having a sister friend like Jacqueline Kennedy to chat with while relaxing in bed before starting the day????? Even in the midst of her financial blessings, this woman was so unique and remained authentic to the end. Thank you for reading and responding to my blog. Just the inspiration I needed this afternoon. I have ordered it and can’t wait to read all about her. Peefect for my gardening library. Thank you, Teresa. You will not be disappointed.Bunny Mellon was such a part of the DC scene and when she was alive, I often imagined meeting her by accident when visiting wine country in Virginia. Thank you for responding to my blog post and enjoy the book. Meryl Gordon…..THANK YOU for commenting on my blog. It was an honor to read and review this book. Living in Maryland, so close to Virginia, I wish I had the opportunity to visit her library…..and of course to see her gardens.What a great opportunity to introduce this book to my gardening friends and followers. Thank you for your kind words…..it truly means a lot! !